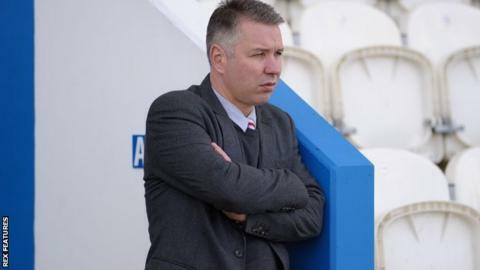 Doncaster Rovers' 4-1 defeat by fellow strugglers Colchester was a "complete embarrassment", according to manager Darren Ferguson. Rovers showed "no character, no leadership, nothing" after Colchester scored four goals in the last 30 minutes, despite Gary McSheffrey giving Rovers a first-half lead. The result sees his side drop to 22nd in League One, with one win from 13. "We are way short of characters and I do fear for this club's safety." Colchester drew level when Chris Porter scored from close range, before two long-range efforts from Elliot Lee and Alex Gilbey pulled The U's clear. Richard Brindley sealed it with a fourth to lift the Essex side from bottom of the table and win their first game at home since October. Doncaster are now two points from safety in League One, despite starting with seven wins from 13 under Darren Ferguson's management. Ferguson, son of former Manchester United manager Sir Alex Ferguson, described it as "possibly the worst half an hour of football I've seen". Having taken charge at the Keepmoat Stadium in October, Ferguson won seven of his first 13 league matches, but his side have suffered 10 defeats and three draws since 2 January. Doncaster now face relegation rivals Blackpool at home on Easter Monday in a ground they have not won at since December. Ferguson suggested he could yet make several changes to his side, adding: "I'm not defending that nonsense, and the lack of things I want out of a football team."